I'll be going with an HF2 instead. jorona11 wrote: Trying to revive this thread for the non-headless Holdsworth owner's like myself. jorona: That looks like it's been stripped down to the bare wood ? I did that once to Fender Jazz bass I bought at a pawn shop in Nashville in 1973; it had been badly abused...didn't realize what "road-worn" meant at the time. When I was done it had that same "raw" grain look to it. It's actually just a Tung-Oil finish over Swamp Ash, which is a wood that tends to look more dry than others, especially with the deepish grain that mine has. My H2 in action. I bought it in late 2003 or 2004. I've never get tired of playing it, although I just got a deal on a used MIA Strat that I couldn't pass up. How hard is it to install a Wilkenson trem on an H2 after the fact ? I'm guessing it's difficult. 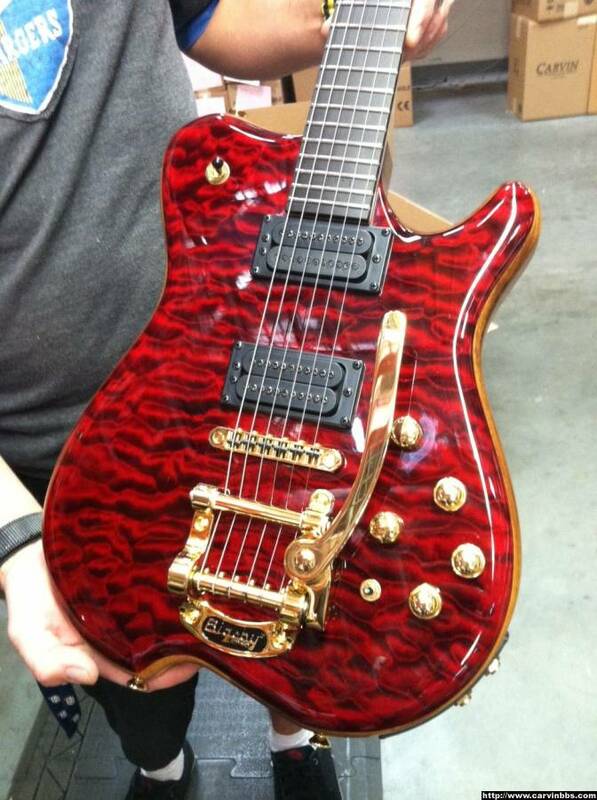 Has anyone ever seen a bigsby on an H2 ? They make one that requires no drilling. I really miss have the whammy for vibrato, much more than dive bombing, and I've never had a Bigsby, but have enjoyed playing a guitar with one recently. It sort of seem out of place on an H2, doesn't it ? It would be removable and not damage the guitar. Obviously I'm conflicted. I love the H2 as is. I love the sustain the guitar offers, but I would love to throw that mellow vibrato into the mix. Guess I can join now! Why yes, I have seen one - enjoy! Woohoo! Hooray for teal HF2's! Lol. Well, it may be an equally obvious question, but how do you like it ? Did it adversely affect the sustain at all ? Is it mind numbingly wonderful ? Alan13 wrote: Lol. Well, it may be an equally obvious question, but how do you like it ? Sorry if I led you astray! 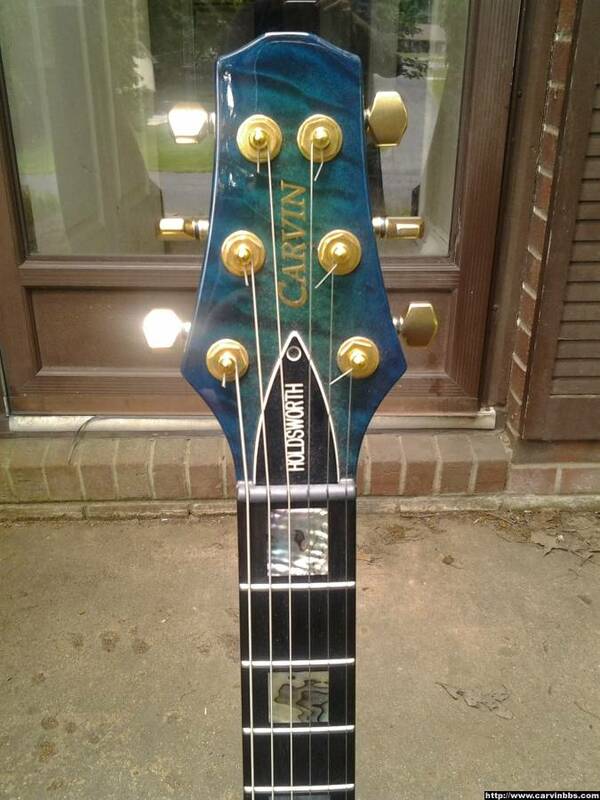 That Teal Carvin isn't mine - i just remembered that one and was able to find it for you. Just trying to help your cause - FWIW your guitar looks perfect the way it is! Wow...teal on spalt looks killer. 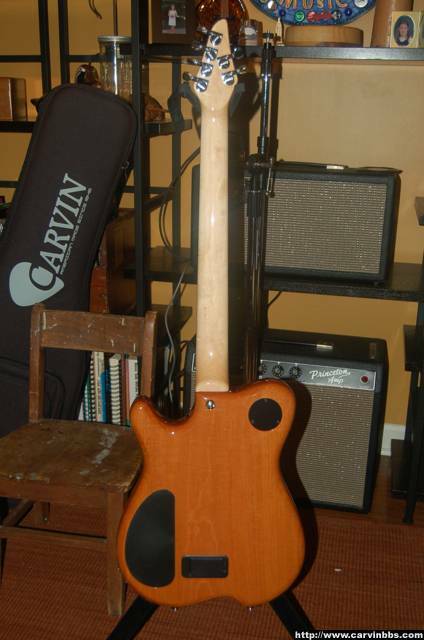 I guess I can join - my first Carvin, an HF2. 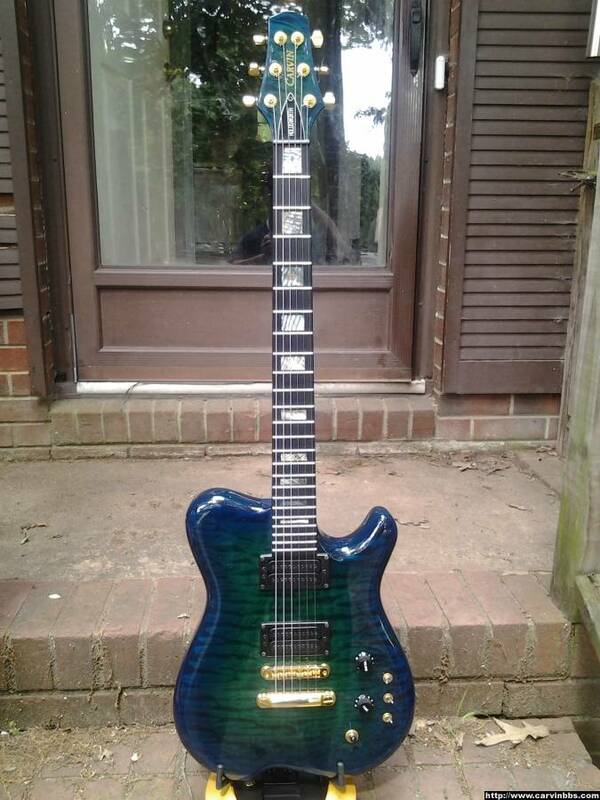 Nice guitar, and I got a great deal on it. Love the pickups and how smooth the volume roll off is. The neck feels great, and it definitely has a unique tone compared to my other guitars - definitely sounds like a semi-hollow to my ears. WOW. Thats sweet. 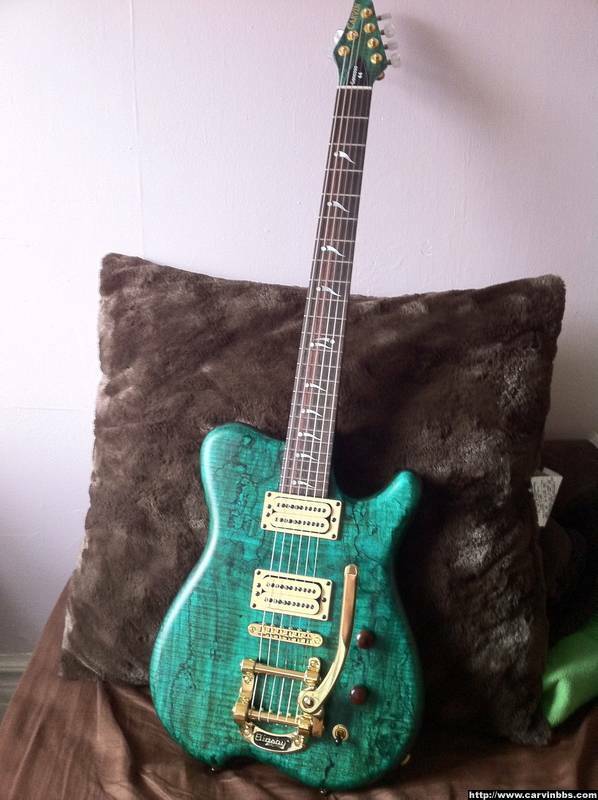 I sold my PRS & ordered a SH65. I'll prob disable the guitar out via 13-pin cable to improve tone. I can't wait!! Last edited by Jazpur on Thu May 22, 2014 11:52 am, edited 1 time in total. Plays amazing -- the action is very low, and the axe still sings. Top and back resonate freely, you can feel the back vibrating as you play. 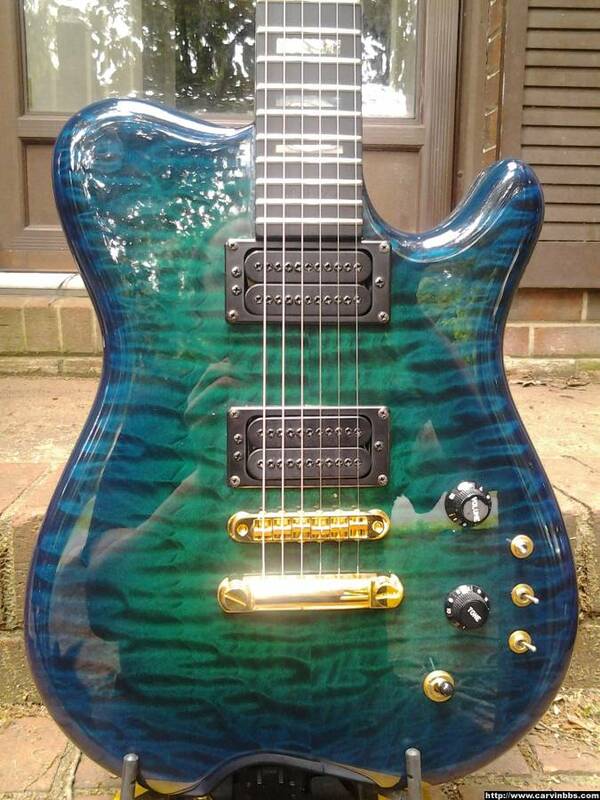 I have other high-quality hollow and semi-hollow guitars, but none have the sustain of this H2. The attack is softened as expected; with a smooth overdrive you are into 335 territory without the adenoidal aspect of '57 classics. I had not been impressed with the Fatboy's neck pickup and considered getting an H1 this time, but I am very glad that I got the H2. 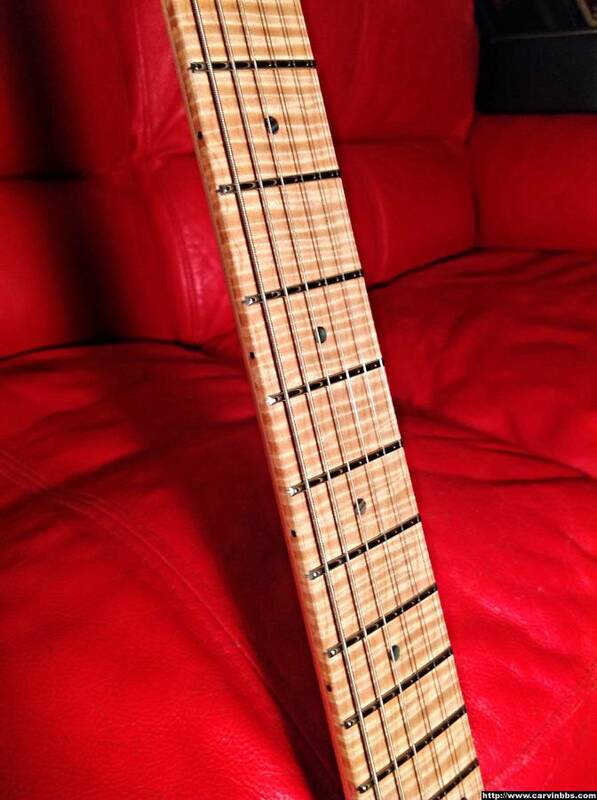 The neck is pretty rich, stands up to gain really well and presents a great modern jazz tone. You won't get Kenny Burrell out of it, but Mike Moreno, Sheryl Bailey, Vic Juris, you're in there. With some gain it's even vaguely Rosenwinkel-esque. I am thrilled with that. Again, the sustain is ridiculous. The in-between position is totally usable. Chimy without sending those Pavlovian Strat-vibes. Great for rootsy/blues with overdrive and for funky chording. What else? I got the stainless frets which I am really enjoying. Totally smooth on the bends. Took a few days to ensure that I don't over bend, but now I don't think I'd go back. The satin finish feels great, very dry and cool. I had the top strap hook moved to the horn which is an option 50, but its hard to imagine the axe balancing with the hook in the original position. 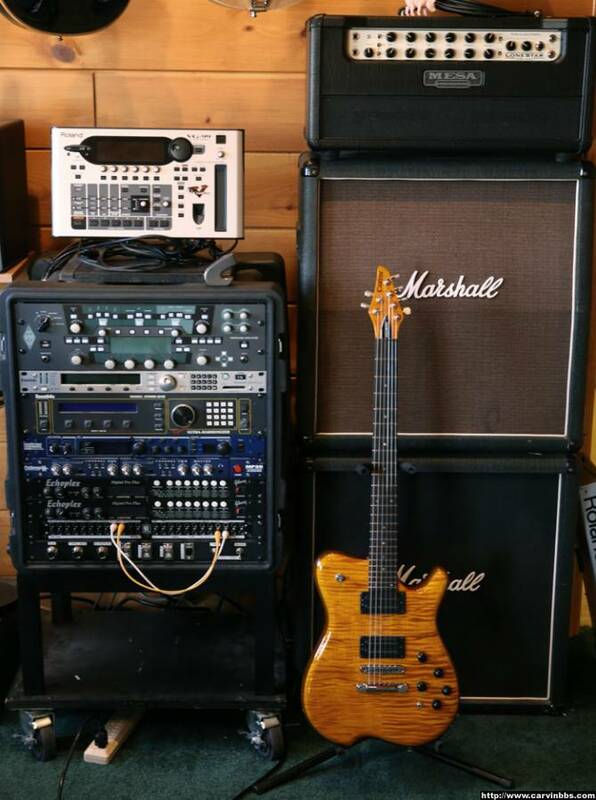 Will try not to run on too much here -- I think the biggest intangible about the guitar is that it is very hi-fi. You're not going to get a full range of expression by pounding on it like you could with a strat, but if you have good control, and a touch-sensitive amp you will make it sing. 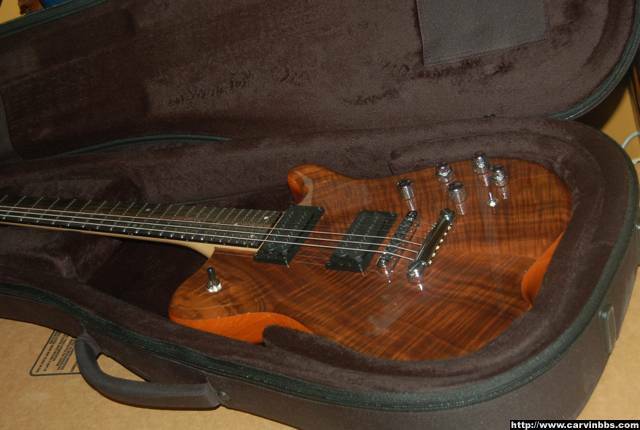 I think this guitar has better sustain than my all-mahogany Fatboy did. 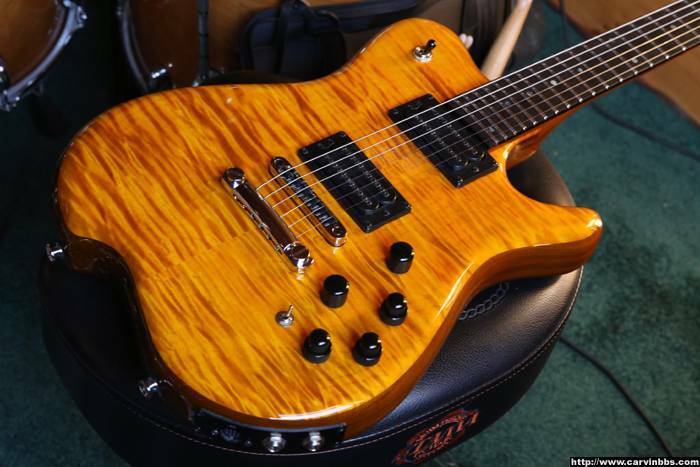 This is standard woods with maple top. 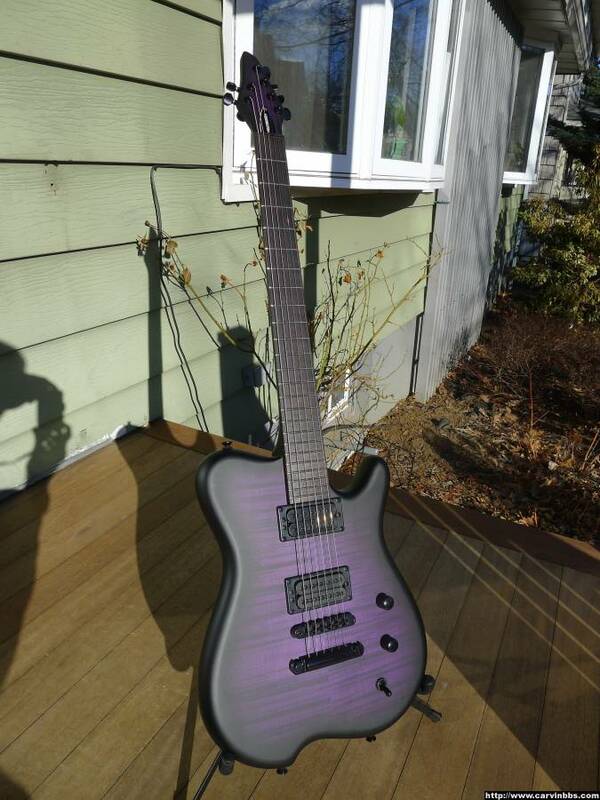 OK, enough -- this H2 in alder and maple is an amazing guitar, and I love the seductive stealth that I got with the satin finish, lots of black and purple bursting out. 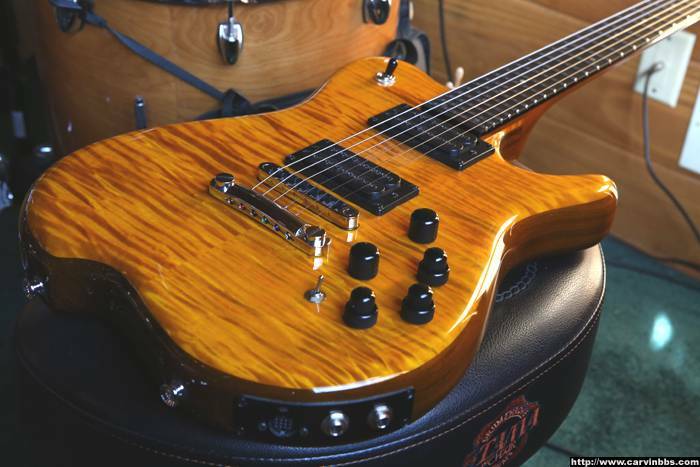 For those with the short trem arm, how do you like it? I have always played Strats (besides my 3 Carvins I used to own,) and have had a short trem arm (Gilmour style) which worked perfect for grabbing with my pinky and doing light shimmer/vibrato. 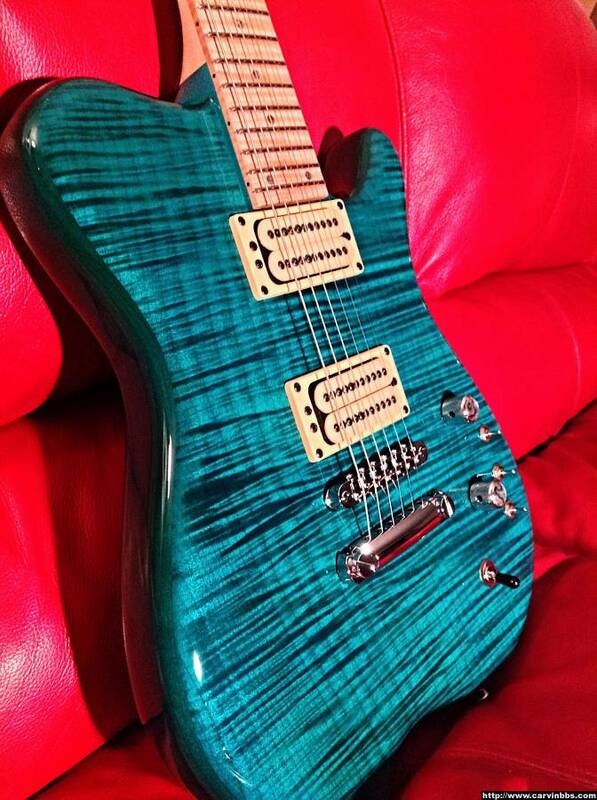 However, I have heard the J-Custom trem is really stiff. So is the short trem arm pointless then? Can you wiggle it with your pinky, or would the tension make that impractical? Thanks for any opinions you guys can share! Here's my Fatboy. I don't think it is DTS, I'm thinking that wasn't an option yet. I ordered it about a week after I met Bundy here in Winston- Salem, and got to play his CT that was finished in Dragonburst. There are some great looking Holdsworths on these pages. Mine arrived for good just the other day. I assume I can officially join the club. This is a "4 wood." 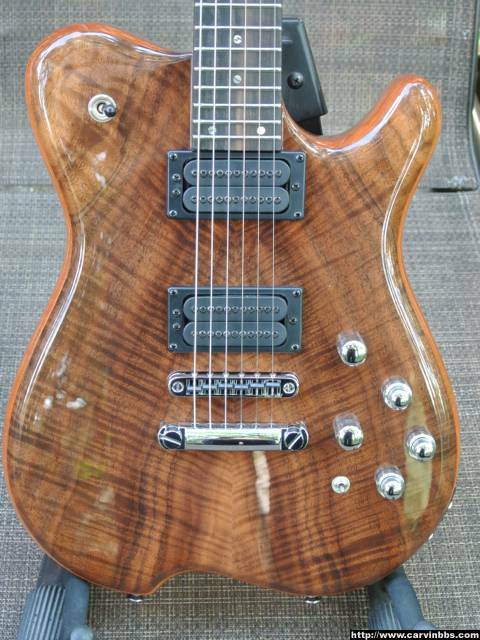 Figured walnut, mahogany body, maple neck, ebony board, HF2S. Natural gloss all round. You know, this is a really nice club! Love the short arm trem on my hh2. No regrets at all. I ordered my HH2X back in April with the short arm...my completion date is 6/26. I'm checking Facebook for pics of mine. Hopefully next week I might see a few pics!